I went to the library today looking for a few books. I really wanted to catch up on some of the mysteries by Arnaldur Indridason but no luck. Then I looked for some graphic novels and there weren’t any that really caught my attention. Finally, I thought well how about a S. J. Bolton book? I’ve liked her thrillers. The only ones on the shelf were once I had already read. Sun and Shadows by Ake Edwardson. Recently Jenclair mentioned several Swedish thrillers and I got the urge to try some too. The Vanishing of Katharina Linden by Helen Grant. The Crossing Places by Elly Griffiths. Triangles by Ellen Hopkins. I loved her YA novel Crank. Second Nature by Jacquelyn Mitchard. So let’s see just how many I actually do read before they are all due back on January 31. Can you believe the 31? I feel like the year just started. The Vanishing of Katharina Linden has been on my wishlist forever! I hope it is good! I can recommend THE CROSSING PLACES. First book in a really great series. Book #3 was just published here in the US. Book #4 just came out in the UK. I love Ruth Galloway (main character). It’s going up and down the aisles that enlarges my stack uncontrollably too. Hope you’ve found some keepers in there! 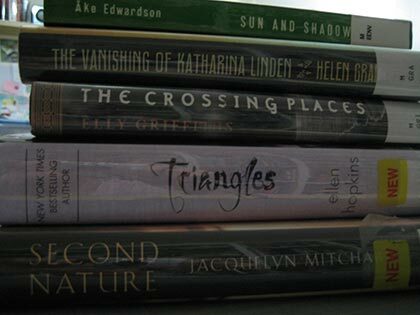 I had been pretty good since the holidays when it comes to library books, but all of a sudden they’ve multiplied! I need to read the next Elly Griffiths mystery, too. And I’d like to give Ake Edwardson a try as well. Happy reading! Enjoy your new library books. I always think I will limit the number of books I check out but never seem to be able to!